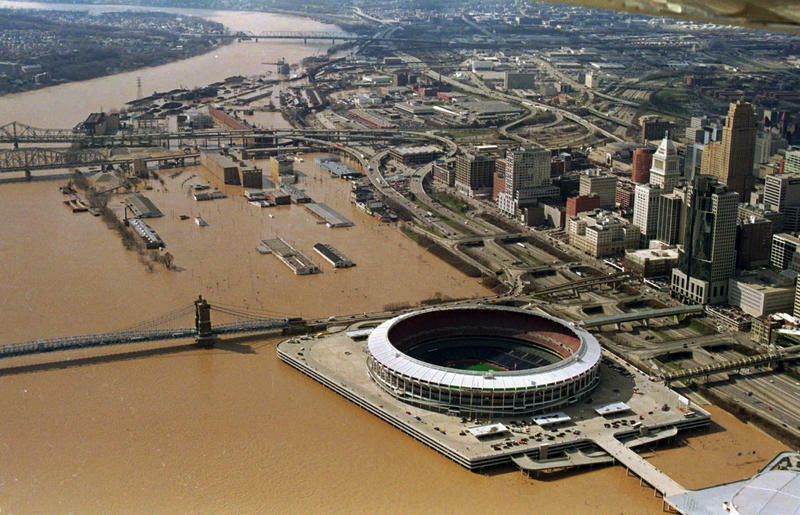 The flooded Ohio River surrounded the city of Cincinnati, Thursday, March 6, 1997. One thing I have learned over decades as a reporter: As horrible and destructive as natural disasters can be, there is something about them that bring people together to survive and get back on their feet. People who don't really know each other. People who often don't know each other's names. They come from different backgrounds, different sides of the track, different religions, and different political beliefs. I've seen it happen, over and over again – in the wake of the destruction of tornadoes; the awesome power of an ocean in tropical storms; in river floods that swallow up entire towns and leave thousands to rebuild their homes and their lives. And where are the politicians during these hard times? Some are making quick forays into the areas hit the hardest where, with TV news cameras in tow, they shake their heads mournfully, hug a few residents, and promise to be there for them to rebuild. But not all politicians are like that. Most care, but only a relative handful are willing to roll up their sleeves and do the hard work in the trenches. Some take off for the disaster zones without calling the TV stations and inviting them along. Some just feel that basic human instinct to help. This is the story of one of them, and what he did to help the people who elected him – and the people who didn't vote for him – in the wake of the incredible destruction of the 1997 Ohio River flood, that left a trail of devastation and desperation from Marietta, Ohio to Louisville. 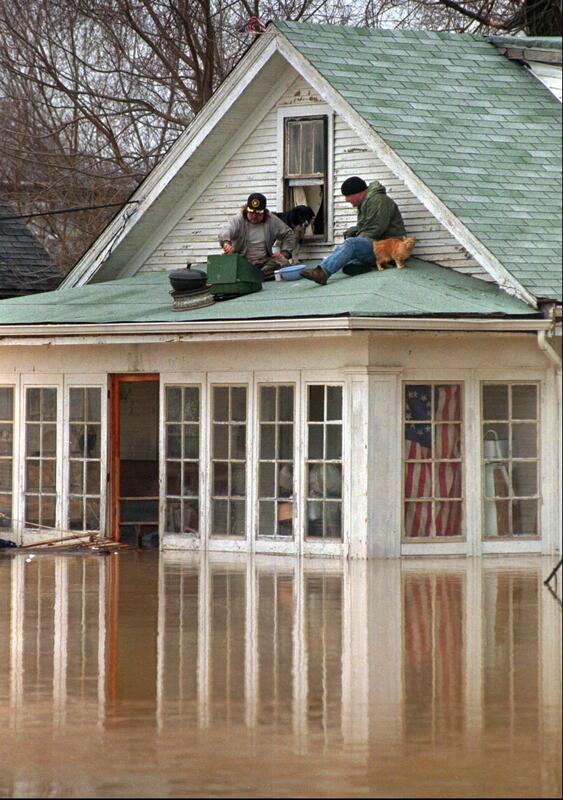 Two men use a camp stove to cook breakfast while staying dry with a dog and cat on the porch roof of a home surrounded by flood waters in the east end of Cincinnati, Wednesday, March 5, 1997. He happens to be a Republican, but it doesn't matter – he could have been a Democrat, a Libertarian, a Socialist or one of the Greens. He committed an act of kindness, of compassion, as did countless ordinary citizens up and down that swollen and suddenly deadly river that winds its way through some of the areas of the worst chronic poverty and persistent joblessness in this region of the country. The Ohio River flood of March 1997 was one of the most memorable stories I have ever covered in my five decades as a reporter; far more gripping, difficult and, at times, heart-breaking, than any politics story could ever be. The Cincinnati Enquirer assigned me and Saed Hindash, a very talented photojournalist who worked in Cincinnati at the time, to spend what turned out to be three days reporting stories of tragedy and gutsy determination to survive up and down the river, from Huntington, W. Va. all the way to Lawrenceburg, Ind. Saed is not only a brilliant photographer, but he was a great traveling companion. We raced up and down the river, searching for roads that would lead to the washed-out small towns on the river banks. Oftentimes, we would make it to those towns and find someone with a small fishing boat to take us around. They were usually glad to do so, because most of them were anxious for the rest of the world to see what that relentless river had done to their homes. The acts of kindness to others we found from people who were in deep, profound trouble themselves are unforgettable. There was, for example, John Jewell of the riverside hamlet of Friendship, Ohio, which, in those days, was home to about 350 souls and about five miles from the Scioto County seat of Portsmouth. And it was almost completely underwater. Jewell's family had lived for generations on land near where Pond Run flowed into the Ohio River. A few days before we reached Friendship, Pond Run was its usual self – a tiny brook you could walk across without getting the top of your boots wet. By that Saturday night, Pond Run was a wide and raging river, burying Jewell's two-story brick home in about 12 feet of water. A cinder block building next door, where Jewell did auto body work, was half-submerged. "Every tool, every piece of equipment I have – ruined,'' Jewell told us. "That water took most everything of value I had." He had built that home with his own hands in 1980, and then lost it in a divorce settlement. But he had bought it back a year before and, just a few days before the rain began and the river flooded, he took out a flood insurance policy. He had called his insurance agent the morning he was there and found out that his policy would not be in effect until 30 days after he purchased it. "That bowled me over,'' Jewell said. "What's the point of buying insurance if it doesn't cover you?" You might think that a person who had suffered the kind of losses that Jewell had in the past week would be angry at the world and the bad hand he had been dealt. But John Jewell would not have a bit of that. At a tiny grocery store he operates in Friendship, he worked night and day, making sandwiches for the Ohio National Guard troops and local firefighters who had been working around the clock to help flood victims and get them to safety. "I suppose I could jump in the water right now and end it all, but I'm not the suicidal type,'' Jewell told us. "There's people worse off than me." That was a fact. We saw them in obscure places like Blue Creek, Ohio, and in better known towns like Greenup, Ky.
At one point, early in the morning, Saed and I ended up in the town square of West Union, county seat of Adams County. West Union was seven or eight miles north of the tiny Ohio River villages that were completely underwater. Saed and I were headed a few blocks from the courthouse square, where there was a local school that had been turned into a makeshift shelter for a few hundred flood victims. We stood outside a restaurant on the square – a restaurant famous for its pies, but sadly, no longer there – and talked to a man who had come up from the school looking for some food for his wife and their three small children. "No telling how long we might have to do here,'' he said. "The Red Cross is helping, but it's hard not living in your own home and I am scared to death of what I might find when we get back there. The place is likely to be ruined." As we talked, I saw a large, dark SUV out of the corner of my eye, pulling up behind our car across the street from the courthouse. The SUV stopped and a familiar face hopped out. Howard! Didn't expect to see you here! 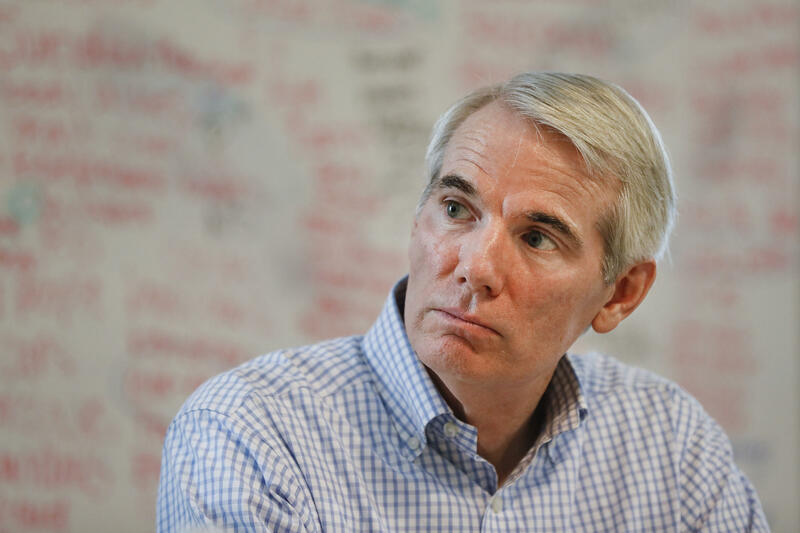 It was Rob Portman, then the congressman for the 2nd Congressional District, which stretched from the east side of Hamilton County out to the western half of Scioto County. 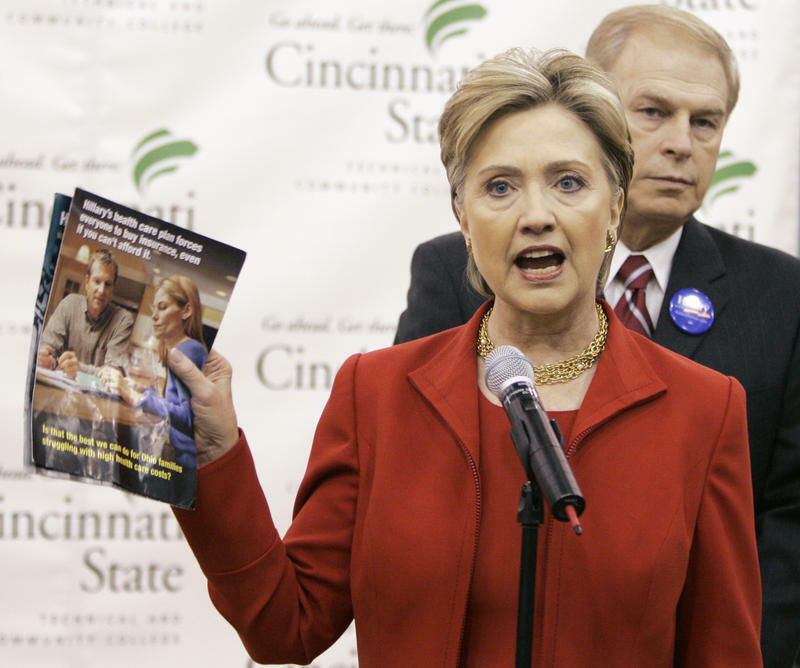 Portman, now a U.S. Senator, had a House District that snaked along the Ohio River, and there were several thousands of his constituents temporarily forced from their homes by the floodwaters. Portman listened to former addicts during a roundtable discussion at the Adams Recovery Center for Women in Cincinnati in July 2017. The back of the SUV was stuffed with children's clothes – clothes his then-small children had outgrown, along with jugs of fresh water, toiletries, cleaning supplies and some food. I decided to load up and come down here and hand out everything I could to the people in the shelter, Portman said. I know it's not enough, but it's better than nothing. He spoke briefly with the man we had been talking to. When he found out the Manchester resident had small children, he opened up the back end of the SUV and invited the man to pick out some clothes for the kids. I've seen politicians do this kind of thing before. What I had not seen, though, was a politician do this without bringing along TV cameras and reporters to chronicle his generosity. Portman had none of that. Just him. Just him and an SUV full of kindness. Just another neighbor helping neighbors.